The town of Banská Bystrica has became an important administrative, cultural, educational and social center of Slovak Republic over the past decades. It is situated in the heart of Europe, in the middle part of Slovakia. It spreads over 407 hectares. It has grown steadily after the World War II., the number of inhabitants has increased rapidly (there are six times more inhabitants living in Banská Bystrica now than before the war) and the town has grown too, spreading its suburbs and new parts further and further away from the center. Banská Bystrica is also the seat of the President Office and plays a crucial role in the banking, financial and insurance industry. Tourism has been growing over the past years, many home visitors as well as foreign tourists have visited this town and been satisfied with the standard of services and vast number of places of interest. A few trade fairs and workshops have taken place in the town and highlighted its economic importance. There are several interesting cultural and educational places of interest in the town ranging from State Opera House, professional Muppet’s Theatre, Museum of Slovak National Uprising, Museum of Central Slovakia, unique Literature and Music Museum, State Library (it celebrated its 75th anniversary of opening in May 2001) and many more. The town of Banská Bystrica is also an important sporting center; skiing in winter and walking in summer are the most popular outdoor activities. The town of Banská Bystrica is quite old, historically rich and unique. 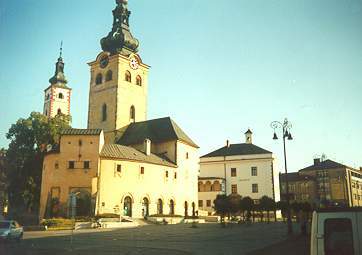 In 1255 town was awarded by its rights by King Béla IV. At the end of 15th and beginning of 16th century mining company was established by Mr Jan Thurza, Mr Juraj Thurza and Mr Jakub Fugger of Augsburg. It soon became the most popular and profitable company of this particular area, exporting metals to Germany, Poland, Italy and Netherlands. In 1577 one of the first printing companies was established in Banská Bystrica. A few decades later, in 1725 one of the earliest textile companies started its production here and soon became very successful. Strategic position of the town was crucial in the antifascist phase of war. Slovak National Uprising – an important historical milestone – started in this town in August 29th, 1944. Religious education in schools and cultural activities have always been a very important part in social life of the town. Further development and growth of Banská Bystrica was seen during the era of Czechoslovakia when it was considered to be one of the nicest and most visited towns of the country.